Arthur's Pass National Park is generally undeveloped when compared to other National Parks in the South Island. This can be one of its best qualities, however it means there are very few bridges across rivers & streams in the Park. Was the weather forecast bad, or is the weather bad? You may well be walking into lots of trouble, our rivers can rise into flood in less than an hour, trapping you between crossings, or out of reach of Huts & bivs. If you are, you really need to be absolutely certain you WILL NOT get into any trouble during the proposed crossing, there is no second chances, there is NO CHANCE of rescue! Can you see the bottom of the River clearly? If not, it is either too deep where your looking, or it is too turbulent, in either case you would choose NOT TO CROSS! Is the entry or exit points steep? You would choose NOT TO CROSS, stumbling on entry or exit can cause you to float into deeper, more severe water. Is there any large rapids or waterfalls not far downstream? You would choose NOT TO CROSS! Is the river flow all confined to one channel? If there could be a wider, shallower, broken (braided) area of the river, you should find it, if not look for a place that is less turbulent, wide, with a stream bottom that looks flat-ish! Have you determined where the River will wash you to, should you be swept away, and if so could you make a planned escape from the grips of the River? If you answered NO to any part of this question, you would choose NOT TO CROSS! Wear clothing that will dry quickly (thermals). Undo your waist belt & chest strap! You and your partners should link arms over shoulders, holding pack handles (top of Pack). 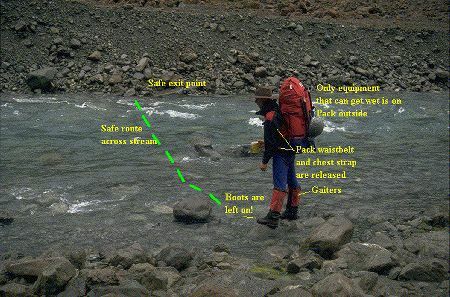 The larger / heavier / person should be upstream. You should enter the River slowly, testing the strength of the current, the depth, the stability of the river-bed. You can always back out at this point. If in any doubt - Back Out! Aim slightly downstream so your route across the River is not battling the current. If anybody sees an upcoming problem (a hole, a large submerged rock etc) let your partners know, so they are prepared to compensate, or change route slightly! Easy to say, but DON'T PANIC!, it just makes you sink! Get your head upstream, release your pack from your back! If you survive, look for your partners path down the river, don't go back into the river to rescue them unless it is very safe to do so, use a rope, a long tree branch etc to swing them into the riverbank. If you've survived this event, change your clothes if the weather conditions make it necessary (cold, wind etc). STOP! WHAT ON EARTH WENT WRONG???? HAVE YOUR ASSESSMENT SKILLS BEEN AT FAULT, IF SO, WAIT TILL THE RIVER SUBSIDES! DON'T GO IMMEDIATELY INTO ANOTHER ATTEMPT, THINK LONG & HARD ABOUT IT! IT'S YOUR LIFE AT STAKE!